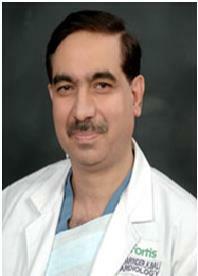 Dr. H. K. Bali, MBBS, MD( Medicine), DM(Cardiology) is the Director of the department of Cardiology, Fortis Hospital, Mohali. Prior to that, he had career stints as Additional professor at PGI, Chandigarh and Senior Cardiologist & Coordinator of the department of Cardiology at Apollo Hospital, Colombo, Sri Lanka. He is an alumnus of Jammu University, where he completed his basic medical studies(MBBS). Thereafter, he accomplished MD(Medicine) & DM(Cardiology) from the prestigious medical institute, PGIMER, Chandigarh. Dr. Bali was honoured with Kataria Memorial Gold Medal (the highest academic award of PGI) for being the best Graduate of the year 1985. Then, he served PGI for more than 25 years as a faculty member. Dr. Bali introduced primary angioplasty for the management of Heart attack in this region. He has more than 5000 Coronary Interventions as a primary operator to his credit. In 2007, he demonstrated for the first time in the world that the free wall rupture of the heart can be managed successfully by device closure (non surgically). In addition to coronary interventions, he has extensive experience in Carotid artery stenosis, intracranial carotid stenosis, aortic stenosis and management of stenosis of other peripheral arteries. He is also proficient in the endovascular management of aortic aneurysms by stent grafts. In 1990, he was awarded D P Basu award by the Cardiological Society of India (CSI) for being the Best Young Investigator of the year. To his credit, he has more than 75 papers in Interventional Cardiology in National & International journals. This work has been presented at a number of International conferences and is widely appreciated worldwide. Besides, he was the first to show the efficacy of stenting for management of patient will Takayasu’s arteritis (Pulseless disease) and this work is always quoted in any publication on the subject. Further, he has been invited as International Guest Faculty at a number of interventional meetings in different places in Europe.